In the quiet Sunset Shores neighborhood of New Buffalo Michigan. Located three blocks from the Oselka's Marina where you can rent boats and jet skis for a day or for a week. The Marina Grand Resort's Café Joe is an easy walk in the morning to grab a cup of coffee and walk the docks or come back for lunch or dinner at the award winning Bentwood restaurant. Anchored Away is also less than a mile walk from downtown New Buffalo and the New Buffalo Public Beach which has been rated one the top ten public beaches in the State of Michigan. The home has three bedrooms and two full baths. There is a king, queen and one set of twins. There is also a full size pull out couch for an extra guest, as well as a crib. 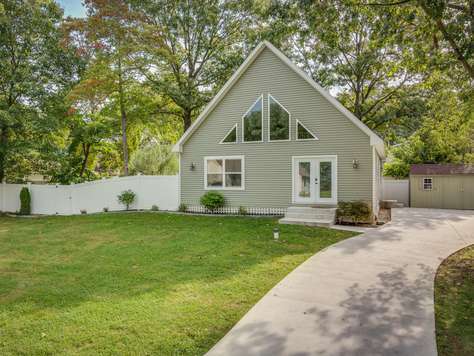 The cottage has hardwood floors, remodeled baths and an updated kitchen given the home a contemporary feel without losing the charm of a beach cottage. There is a very large fenced in back yard that is great for bringing yard games or just letting the kids have a safe place to run around while you grill and get dinner ready. Walk to downtown New Buffalo shops, restaurants, hotels, and the Amtrak Train Station. Fabulous Bridgewater three bedroom, end unit, on the second floor is filled with natural light. 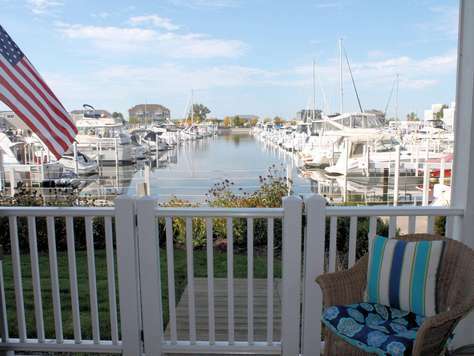 Panoramic views include waterfront marina, partial view of Lake Michigan and downtown New Buffalo. An open floor plan with seating on the covered porch for 6. 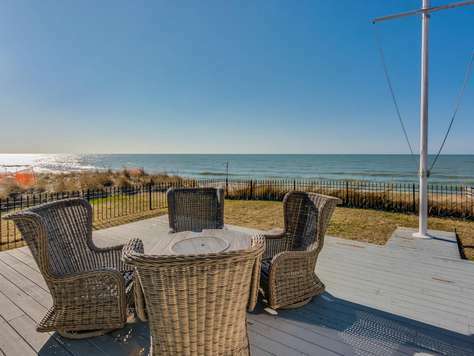 Located a block from the beach this condo offers something for all to enjoy. Once you park in the secured lot no need for a car the rest of your stay unless you decide to venture to one of the wineries, casinos, or breweries, all within a 10 minute drive. Plus...Bridgewater Condos offer a heated outdoor pool in the summer months, a large state of the art work out facility, and a heated indoor pool for guests to use. Well appointed first floor condo in the heart of New Buffalo. Downtown New Buffalo offers shops, restaurants, boat rentals, wave runner rentals and some quaint stores for picking up stuff for the family and friends that could not make the trip with you. You also have the New Buffalo beach, and you can not forget all the wineries with 10 miles of New Buffalo. This 2 bedroom, 2 bath condo is newly constructed and has all high end amenities to include Hardwood floors, gas fireplace, granite counter tops and top of the line appliances. Other fun options include a day trip to Chicago via the Amtrak or a night out at the Four Winds Casino. Fall weather promotes the picking of the perfect pumpkin and a hay ride; picking apples; a walk through Warren Woods Nature Park or just sit back and relax. There's just so much to do and so little time! View from the Top offers: State-of-the-Art Fitness Room Indoor (heated) and Outdoor swimming pools. New Buffalo Amtrak station is steps away with daily direct service to/from Chicago and daily direct service to/from Detroit. 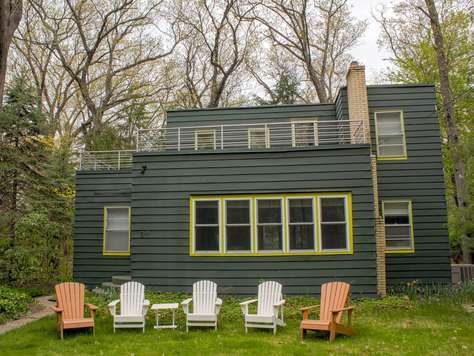 Modern cottage on wooded lot in a small private community just over a mile from Downtown New Buffalo, Michigan with three bedrooms, two baths and a wrap-around country porch that's partially screened-in. There are two bedrooms on the main floor that share a full bath. The second room on the main floor has a queen bed and its own entrance or exit to the back porch. The master bedroom on the second floor has an outside balcony and a bath with a tub and shower. The roads that wind though the trees and the natural surroundings of the area are great for short walks or a bike ride. Guests have access to the Harbor Dunes association swimming pool and they have a pass for free parking at the City Beach on the New Buffalo waterfront. During peak season, this property rents from Friday to Friday. Contemporary single-family home located in the Buffalo Camp Cottages community which caters to getaway weekends and relaxing family fun. There are two floors and two areas for entertaining, so the kids can be watching movies in the cozy TV area downstairs, while the adults are entertaining and cooking dinner upstairs. 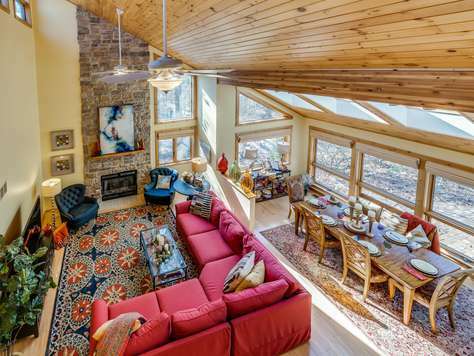 Dramatic 16 foot tall ceilings, exposed stained cypress logs, and floor to ceiling stone fireplace will make you feel like you're in a rustic mountain lodge. The master bedroom, off the upstairs family room, features a king size bed and private bath. The guest room downstairs also has a king bed and is large enough to spread out luggage or to set up a playpen (provided) for the young ones. There is one child oriented bedroom on the lower floor that has trundle bed and a twin size bed that can sleep up to 3 kids. From the top floor, two large sliding glass doors open out onto a serene screened in 10' x 25' porch, that looks out over wooded hills. The lower level family room enters out to another 10' x 25' screened in porch, that also features a 6 person hot tub. Just outside of this porch, is an enchanting raised stone fire pit area that can easily seat 10 people, and provide hours of late night fun. Adjoining the fire pit is a deluxe swing set that the kids will also love. There is a community pool, outdoor theater and clubhouse that can be shared by all residents/renters. A short 10-15 minute walk to Downtown New Buffalo and the beach and a stones-throw from Oselka City Park, which has baseball fields, playground equipment, and tennis courts. Peak Season Rentals: This property rents from Fri. to Fri.ONLY. Located in the charming village of Grand Beach Michigan, this four bedroom, four bathroom home offers plenty of space for all to gather. The main level offers an open floor plan with plenty of seating as well as a kitchen made for cooking. From the grand master suite with Jacuzzi tub to the bunk room with four trundle style bunk beds and large playroom with a 60" television, there's plenty of room and comfort for everyone. This classic Grand Beach home is close to golf, playground, tennis/basketball courts, club house, riding stables, shopping, restaurants, casino, wineries, fishing and of course beautiful Lake Michigan! Grand Beach has so much to offer kids of all ages so be sure to bring your golf clubs, beach gear and beach chairs. There is also a four seat golf cart available for your use during your stay; the preferred mode of transportation around the village! 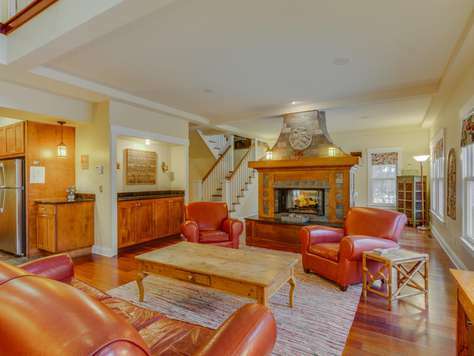 Spacious 5 bedroom, 3.5 bath townhome with an Association pool and a outdoor fire-pit. Ideally located on a quiet non-through street less then a mile from the town of New Buffalo and the New Buffalo public beach. 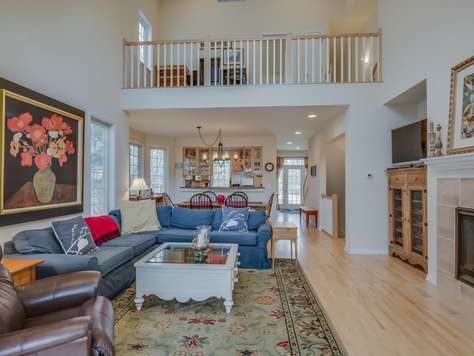 Open floor plan with three levels of living space, allowing families room to spread out. Back of the townhome faces a wooded ravine with outdoor seating for you to enjoy a morning cup of coffee, or a great spot to catch up with your favorite book. Great location, Pool, Fire-pit, and 4 bedrooms spread out over three floor makes this a great place to get away. This well appointed townhome is a two-minute drive from downtown New Buffalo but remote enough to provide some privacy and some well deserved quiet time. Two levels of living space with a roof top deck for outdoor seating. Enjoy the clubhouse with indoor heated pool, hot tub and fitness room. GREAT VALUE. Contemporary ground floor unit with 2 bedrooms, a sleeper sofa and 1 full bathroom in the heart of Everything. For boaters or individuals wanting to be by the Marina this is the place for you. Fully upgraded with all new furnishings and a great modern feel. Deck with outdoor seating faces the water, so you can enjoy some of the most beautiful sunsets without leaving your place. Be able to walk to town, the beach, and if you have a boat your on the Marina so you can not get any closer. GREAT LOCATION ! This property is well maintained and equipped for the comfort and convenience of our guests. Our vacation rentals include well-equipped kitchens, living and dining areas. Linens and towels are provided. Homes have washers and dryers, dishwashers, central heat and air conditioning, cable/satelite television, DVD-players, and high-speed Internet service. We ask that renters bring condiments, diswasher soap, laundry soap, extra toilet paper and convenience items like plastic wrap, aluminum foil, and zip lock bags. We do not resupply anything during the stay. We provide two rolls of toilet paper for each bathroom, 2 rolls of paper towels, 4 garbage bags, and hand soap in each bathroom so plan according to your needs. Newer construction tucked away at the end of cul-de-sac, this open floor plan home features six bedrooms, a suite with kitchenette, four and a half bathrooms, large living room, wrap-around porch, 4-season lanai, two fireplaces, a fitness room and nicely equipped kitchen. 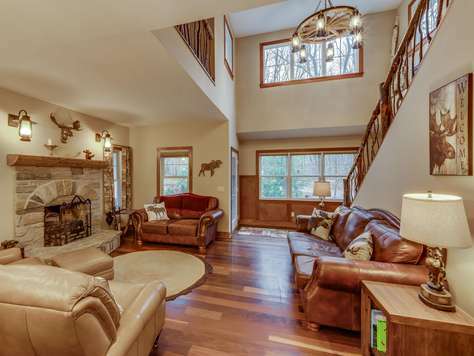 The home is well-appointed and thoughtfully decorated throughout to provide the feel of the Michigan northwoods. The exterior is ideal for entertaining. A 2-level deck offers tons of seating, an outdoor kitchen with gas grill, and hot tub -- all surrounded by an exceptionally well maintained garden. The Buffalo Cottages Community has a communal pool, club house and outdoor theater for all to enjoy. Northwoods Lodge is a 10-15 minute walk to downtown New Buffalo, restaurants and the beach -- and just a stones-throw from Oselka City Park, which has baseball fields, playground equipment, and tennis courts. Grand Beach area -- new construction. 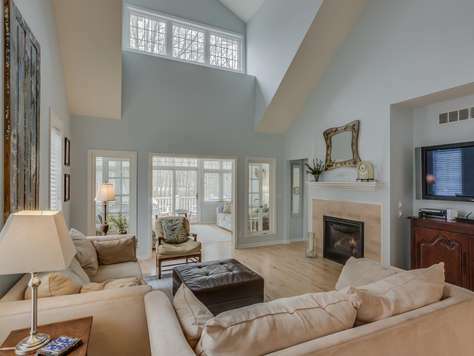 Two-story ceilings in the great room and 1,600 square feet of living space spread over two floors. This home is convenient to downtown New Buffalo and other area attractions. Unique dining at Stop 50 Pizza and the Tree House Cafe just minutes away. This thoughtfully finished home includes child-friendly touches such as cordless blinds, a pack and play, baby monitor, and dual twin beds with trundles to accommodate your youngest guests. The large fenced yard offers room to roam and enjoy the outdoor deck with grill and outdoor fireplace. Indoors, WiFi, mobile signal booster, cable and a generous master suite ensure you have all the amenities you need to relax in style. The property has a total of three bedrooms upstairs and you have extra sleeping area with a queen and two twin beds in the lower level space. Location. Location. Location! Condo located in the heart of New Buffalo.The condo offer 2 bedrooms, 2 bathrooms, and an open floor plan with views of the marina. The building also has an indoor pool open year round, an outdoor pool open in the summer months and a gym open whenever you feel motivated enough to want to work out. Why drive when you can walk to everything. Cute, colorful, bright and clean rental sleeps 10, with 4 bedrooms and 3 baths. The newly updated main level features an open concept kitchen, dining and family room w/ 3 bedrooms, 2 bathrooms and a laundry room. A spacious master suite w/ private bathroom and screened in balcony are located upstairs. 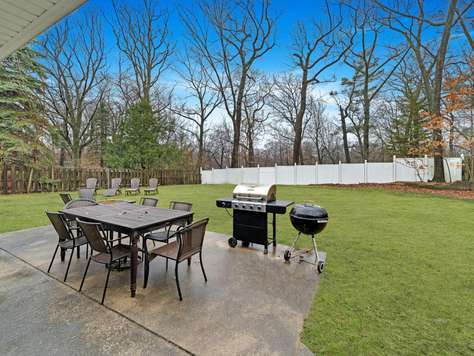 Private, fenced-in backyard with fire-pit, in-ground pool, and a gas grill for cooking. Bring your four legged family members because this home is pet friendly to dogs under 50 pounds. Walking distance to town, beach, restaurants, and shopping. This property offers all guests the use of a free parking pass to the public beach. Bentwood Tavern, a popular water-front restaurant is located across the street. Short drive to the Four Winds Casino Resort. Enjoy a rental home that avoids that rental feeling. This 4000 sq. ft. townhome offers 5 bedrooms, 3.5 bathrooms and three levels of living space. Just outside the door you will find a communal fire-pit and a pool that is shared with just a handful of homes. The mature trees and peaceful surrounding lend itself to a perfect getaway for you and your family to enjoy. Extremely well appointed, 5 bedrooms and still just minutes from downtown New Buffalo how could anyone go wrong. Association has a 4 car max for renters so please make sure to carpool as anything more then 4 cars will need to be parked elsewhere. Tucked away in the wooded Walden cottage enclave sits Tallgrass Cottage, a healing sanctuary for you and your family for a week or weekend. Surrounded by nature, but within walking distance of the quaint downtown of New Buffalo, and less than a mile from the New Buffalo beach, Tallgrass is a short 70 miles from Chicago. Once here, you'll immediately notice how the sweet, fragrant air will begin to relax you. Stepping inside Tallgrass, you'll be struck by the openness and abundance of natural Michigan light streaming in from all sides, including the multiple skylights. You won't come for the granite counter tops, stainless sinks and appliances, nuanced lighting or vaulted ceilings in the great room, but each will make your stay more comfortable and distraction free as you use our home as a base for your daily excursions around southwest Michigan. Wine tastings at the multiple nearby wineries, seasonal festivals, world-class antiquing, kayaking, fishing, golf on challenging and pristine courses, and cycling are just some of the activities you and your family or friends can enjoy during your visit. 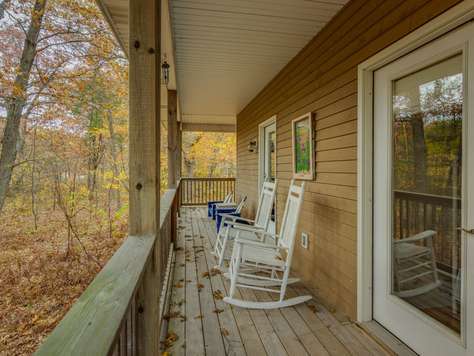 At night, kick back on the open deck, or read that novel you've been meaning to get to on the screened-in porch. Plan a dinner at one of the nearby, one-of-a-kind restaurants, or grill out under the brightest stars you never get to see in the city. With three bedrooms, three full baths, and an activity loft for you and the kids, Tallgrass accommodates four to six people comfortably. Don't wait. Reserve your vacation time with us today. If you do, we promise you'll want to come back to see us again and again. 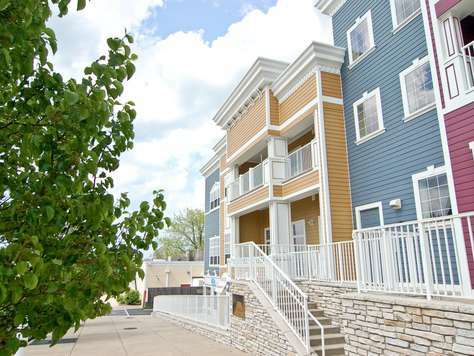 This two bedroom two Bathroom newly constructed condo is located in the Heart of New Buffalo. If you are like me an do not feel like driving all day long while on vacation this place is for you. Within minutes you can find yourself at the beach, eating at one of the fine restaurants, shopping at one of the many stores, or maybe just hanging out at the pool. This is the place to be for a stress free vacation. Almost forgot you also have a gym in the building. Log cabin on six beautiful acres of land with over 500 feet of Galien River wrapping around the property. The house offers almost 3000 square feet of living space spread out over three floors with four bedrooms and three and a half bathrooms. 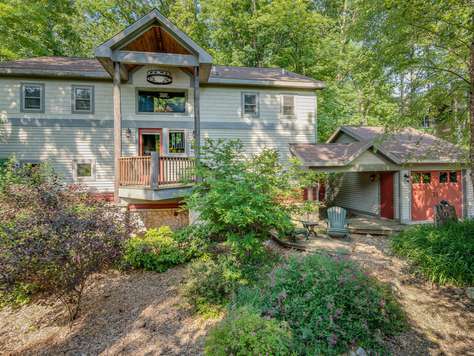 An 850 square foot deck sits off the back of the house facing the Galien River. A newly added outdoor hot tub helps you to enjoy the winter months outside while taking in the views from the deck. Why not spend some time finding yourself again. This house offers all the amenities of home—all you need to bring is the desire to relax. The interior was designed to make you comfortable and avoid that “rental feeling.” You can’t pick a better place if privacy is important—there are no neighbors within sight and the view from all sides is wooded. If you decide to venture out, you can enjoy the area by taking a five minute trip to downtown New Buffalo where the beach is located. Visit the quaint stores, go antique shopping, or just enjoy the many restaurants, cafes, and wineries within minutes from the house. There is even a full service day spa in the downtown area. If you are looking for active things to do, the area offers kayak and bike rentals. Take a nice run by the lake or enjoy some of the best rolling hills for bike rides. The new Four Winds Casino is located five minutes away and Whittaker Golf coarse is ten minutes from the house. You are also close to Indiana’s Lighthouse Outlet Mall. All beds are high quality. Three of the four queen beds have pillow top mattresses, Double Beds (1) Located in the lower level. Lower level is a great space for the kids to hang out with a TV, DVD player and a full bathroom., Twin or Single Beds (2) One twin bed in each of the upstairs bedrooms., Sleep Sofa or Futons (2) Spacious day bed sits in great room next to wood burning fireplace. Additional sleeper sofa in the lower level. Lower level also has a full bathroom, TV, DVD player, and a pellet fireplace. This modern style architecture has a cozy, cottage feel. Nestled in a very friendly neighborhood, the pine trees provide the house privacy. 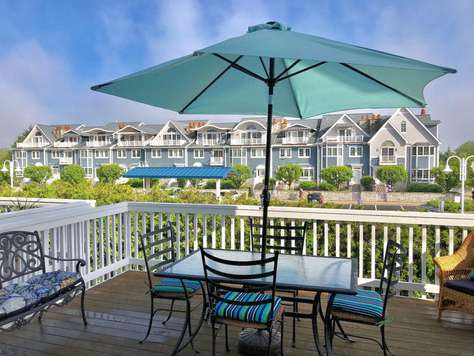 The spacious beach is only five blocks away, and is a fairly easy walk for all ages. Well-maintained tennis courts and an extensive children’s playground are a short walk away. The house sleeps comfortably six with 3 bedrooms and 2 baths. Two bedrooms are on the second floor: one has a double bed and the other a queen bed. A large antechamber between the two bedrooms has a single bed. The third bedroom is on the first floor with a day bed that can sleep a single or pull out to a king sized bed. French doors opening into the third bedroom allow it to double as a general usage room during the day. The family room has a pullout sofa bed. Enjoy the comforts of newly renovated rooms, including the kitchen, bath and bedrooms. 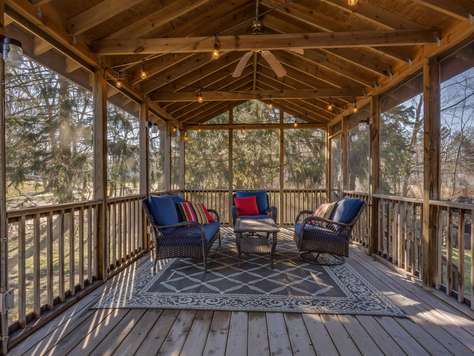 After a day at the beach, enjoy the serenity of the screened-in porch or step out to the outside porch and relax in the hot tub. 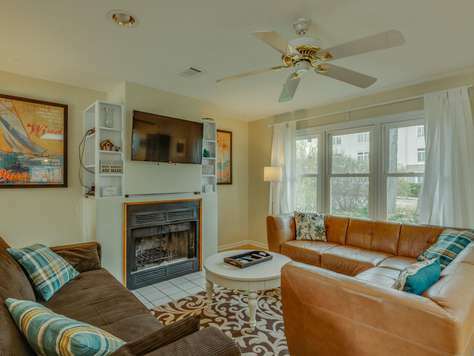 Inside, enjoy all the amenities of home: a comfortable family room with TV, cable and wireless internet. The dining room has a long table, ideal for entertaining or for family meals. When weather permits, enjoy the porch for dinner with an outdoor dining table. New Buffalo is a 10-minute drive away and has several restaurants, shops and delicious ice cream. The outlet of Michigan City, and the antiques and wine country in Michigan are a short trip away. 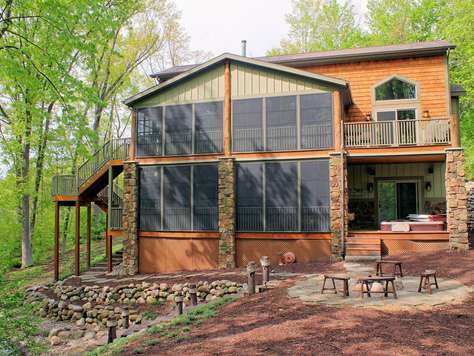 Nestled into wooded landscape in Michiana, this vacation home features 3 bedrooms, 2.5 bathrooms with a modern open floor plan. Wills Way features a striking stone fireplace, cathedral ceilings in the living room, hardwood floors throughout and walls of windows and large skylights bring the outdoors in and frame the views. Outside, enjoy the private back yard with several patios, comfy furniture all-around, a water feature, fire pit and charcoal grill/smoker. 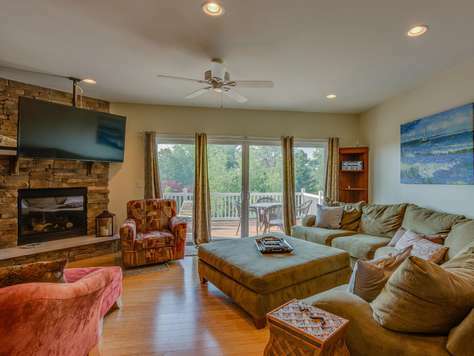 Wills Way is a warm and charming home with a traditional upscale flair -- a lovely sanctuary for a peaceful getaway or entertaining with friends and the perfect locale to take advantage of all that a Michigan vacation rental has to offer. A short (8 to 10-min) walk to one of Michiana's several beaches. The village offers a park, tennis and basketball courts -- also within easy walking distance.